You can customize the Learning header for your account. 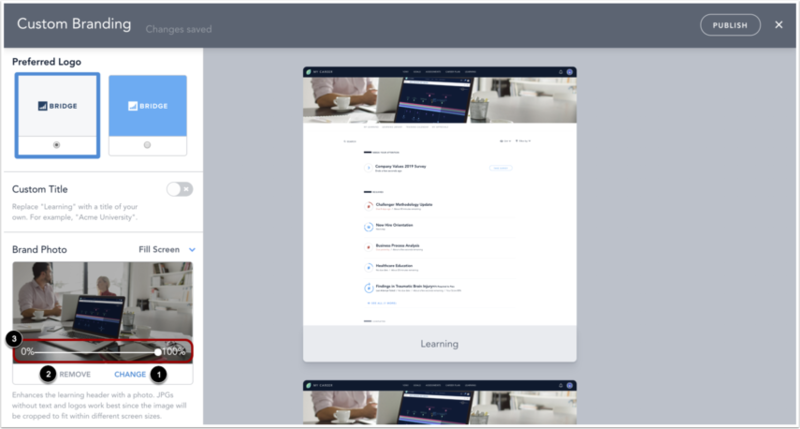 Custom Learning headers display on the Learning page and the Learning Library. To customize the Learning header, click the Learning Header link. To use a custom brand logo, click the Brand Logo toggle button . Then select your preferred logo . Preferred logos can be uploaded in the Custom Branding editor. Note: The Custom Title option must be disabled to enable the Brand Logo option. To use a custom title, click the Custom Title toggle button . Then enter your title in the Custom Title field . Note: The Brand Logo option must be disabled to enable the Custom Title option. To upload a brand photo, drag an image file into the Brand Photo field or browse for an image file. To upload a different brand photo, click the Change link . To remove the current photo, click the Remove link . To adjust the transparency of the photo, use the Transparency slider . To adjust how an image is formatted in the header, click the Format drop-down menu . Then select a format option . 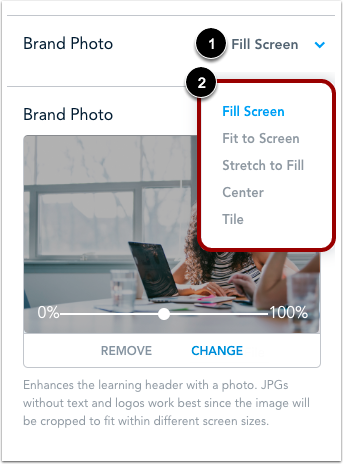 Format options include Fill Screen, Fit to Screen, Stretch to Fill, Center, and Tile. 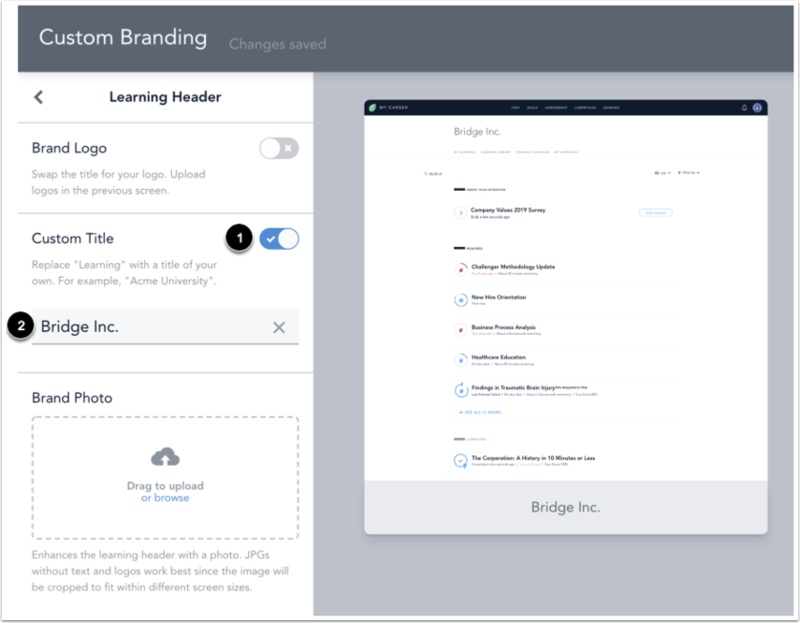 Preview your custom header in the Learning page  and Learning Library . Previous Topic:How do I add a theme color to my account? Next Topic:How do I edit content branding for my account? 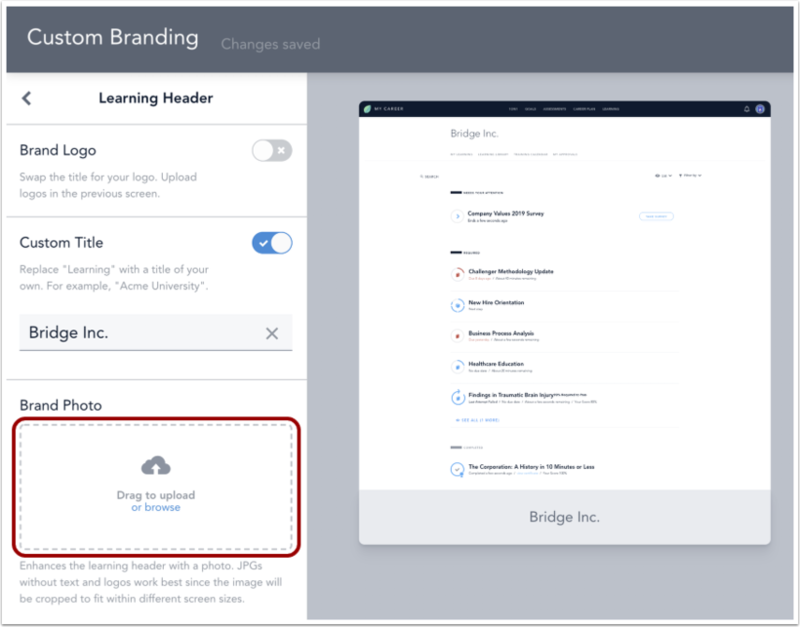 Table of Contents > Manage Account Settings > How do I customize the Learning header?